Peel the carrots and then using a julienne peeler, julienne the carrots and place in a large mixing bowl. If you do not have a julienne peeler you can do it by hand or you can grate the carrots using a cheese grater. Wash the kale then using a sharp knife, remove the hard stem. 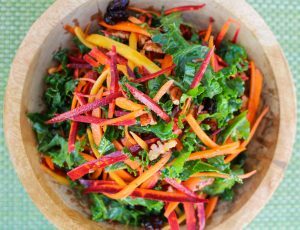 Finely slice the kale into thin strips then add to the large mixing bowl. Chop the pecans then add to the bowl with the vegetables along with the cranberries. In a small bowl mix the remaining ingredients then add to the large bowl to dress the salad. Check the seasoning of the salad then serve.